National Donate Your Hair Day…with Pantene Beautiful Lengths. Disclaimer: I have partnered with Pantene for this amazing campaign; all opinions on this post are my own and this post has not been edited by third partiers. Hey everyone! Years ago, one of the first posts I wrote for Fab Chic and Fit (my first blog) was about how I wanted to donate my hair…and all the details on how you could to. For me it’s such a beautiful gesture…it is letting go of something we are so attached to in order to help women suffering from Cancer to feel beautiful and feminine. Unfortunately, after years of letting my hair grow- I couldn’t donate it since I had the Keratin treatment done (and then the ombré); but it is still on my bucket list….and I really hope that it is on yours too. So let’s start by letting our hair grow longer and healthier …I recommend the Pantene Pro-V Beautiful Lengths Collection. It offers a shampoo, conditioner, and a 2-in-1 to strengthen hair against damage that leads to breakage. Then you are ready to share it with a woman who needs it through the Pantene Beautiful lengths Program- this program creates free wigs for women undergoing cancer treatments. PLUS, Pantene is donating over $1 million dollars this year to help women fight cancer! In celebration of the campaign’s eighth anniversary, telenovela superstar Maite Perroni will be meeting fans and asking the local Miami community to donate eight inches of beautiful, healthy hair to help bring smiles and confidence to those women in treatment by giving them the opportunity to have a free real-hair wig. § Time: 5:00 p.m. – 6:00 p.m.
To find out more about the hair donation process and how you can help, please visit www.BeautifulLengths.com and like Pantene North America on Facebook. You can also follow @Pantene on Twitter and @PanteneHair on Instagram. ¡Hola a todos! Recuerdo que hace más de 5 años, uno de mis primeros artículos en Fab Chic and Fit (mi primer blog) fue sobre los requisitos para donar nuestro cabello a pacientes de cáncer. En mi opinión, es un gesto HERMOSIMO; muchas mujeres (incluyéndome) nos apegamos mucho a nuestro cabello… y cortarlo sabiendo que va a hacer sentir a una mujer mejor, es la mejor recompensa. Lamentablemente, aunque lo dejé crecer por años, luego me enteré que no podía donarlo por haberme hecho la Keratina…lo cual me puso muy triste. Pero es una de esas cosas que sigo queriendo hacer… y espero que muchas de ustedes se animen en algún momento de sus vidas. Para celebrar el octavo aniversario de la campaña, la súper estrella de telenovelas, Maite Perroni, estará disponible para conocer a sus fans e invitará a la comunidad local de Miami a donar 8 pulgadas de cabello hermoso y en buena condición para traer sonrisas y subir el autoestima a mujeres que estén en tratamiento regalándoles la oportunidad de tener una peluca de cabello real gratuita. § Hora: 5:00 p.m. – 6:00 p.m.
Para obtener más información sobre el proceso de donación del cabello y cómo puedes ayudar, visita www.BeautifulLengths.com o encuentra a Pantene North America en Facebook. 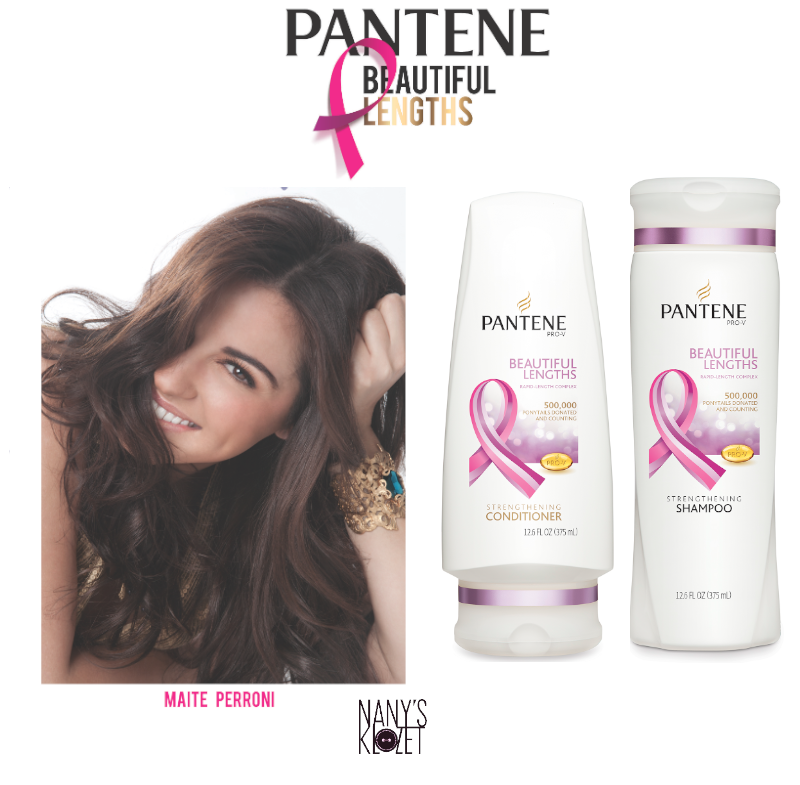 También puedes seguir a @Pantene en Twitter y @PanteneHair en Instagram. This sounds amazing! When is National Donate Your Hair Day? Are there any events in NYC? I would love to donate.